Early descendants of Lionel CHANCEY & Elizabeth BEVIS of Wiltshire county in Dorset and later, Cullompton in Devon, England. Lionel & Elizabeth were married on Mar 7, 1747 in Dean of Salisbury, Wiltshire, England. They had 6 children before Elizabeth died in Jan 1758. St Andrews, Cullompton, Devon -- "22nd Nov 1799, Mr Lionell CHANCEY who was clerk of the church for upwards of 50 yrs"
1. Lionel Chancey was born about 1727. He was buried on Nov 22 1799 in St Andrews, Cullompton Devon England. Lionel married (1) Elizabeth Bevis on Mar 7 1747 in Dean Salisbury Wiltshire England. Elizabeth was born about 1729. She was buried on Jan 31 1758 in St Andrews, Cullompton Devon England. + 2 F i. Bridget Chancey was born on Dec 26 1748 in Lyme Regis, Dorset, England and baptised on Sep 9, 1750 at Whitechurch Canonicorum near Lyme Regis, Dorset. She died after 1807. 3 M ii. Lionel Chancey was born on Jul 26 1750 in Cullompton Devon England. He was christened on Sep 9 1750 in St Andrews Cullompton Devon England. He was buried on Aug 17 1753 in St Andrews Cullompton Devon England. 4 M iii. William Chancey was born on May 21 1752 in Cullompton Devon England. He was christened on May 22 1752 in St Andrews Cullompton Devon England. He was buried on Nov 15 1753 in St Andrews Cullompton Devon England. + 5 M iv. Lionel Chancey was born on Oct 31 1753. He was buried on Jul 4 1822 at St John the Baptist Anglican Cathedral in St Johns, Newfoundland. 6 F v. Mary Chancey was born on Apr 20 1755 in Cullompton Devon England. She was christened on May 20 1755 in St Andrews Cullompton Devon England. She died after 1807. 7 M vi. William Chancey was born in Cullompton Devon England. He was christened on Nov 24 1756 in St Andrews Cullompton Devon England. Lionel married (2) Sarah about 1764 in the Cullompton area of Devon England. Sarah was buried on Aug 16 1771 in St Andrews, Cullompton Devon England. 8 F vii. Sarah Chancey was born in Cullompton Devon England. She was christened on Feb 15 1765 in St Andrews, Cullompton Devon England. She died after 1807 in Cullompton Devon England. 9 M viii. Thomas Chancey was christened on Sep 23 1770 in St Andrews, Cullompton Devon England. He was buried before Jul 1771 in St Andrews, Cullompton Devon England. + 10 M ix. Thomas Chancey was christened on Jul 7 1771 in St Andrews, Cullompton Devon England. He died in 1808 in St. Kitts, West Indies and his detailed will is available online elsewhere. 2. Bridget Chancey (Lionel) was born on Dec 26 1748 in Lyme Regis, Dorset England. She was christened on Sep 9 1750 in Whitechurch Canonicorum, Dorset England. She died after 1807. Bridget married John Pearse on Mar 28 1771 in St Martin, Exeter Devon England. John was born about 1751. 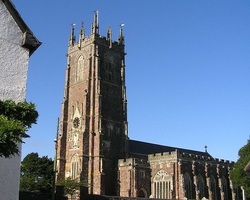 11 F i. Elizabeth Pearse was christened on Jul 8 1772 in St Peters Cathedral, Exeter Devon England. 12 M ii. Jonathan Furlong Pearse was christened on Mar 11 1776 in St Peters Cathedral, Exeter Devon England. 13 M iii. Charles Furlong Pearse was christened on Mar 20 1783 in St Martin, Exeter Devon England. 14 M iv. Joseph Pearse was christened on Mar 20 1783 in St Martin, Exeter Devon England. 16 F vi. Catherine Pearse was christened on Mar 20 1783 in St Martin, Exeter Devon England. + 17 F vii. Maria Pearse was christened on Jun 19 1785 in St Martin, Exeter Devon. She died on Jul 3 1857. 18 M viii. John Pearse was christened on May 22 1789 in St Martin, Exeter Devon England. 19 M ix. George Pearse was christened on May 22 1789 in St Martin, Exeter Devon England. 5. Lionel Chancey (Lionel) was born on Oct 31 1753 in Cullompton Devon England. He was christened on Nov 2 1753 in St Andrews, Cullompton Devon England. He was buried on Jul 4 1822 in St John the Baptist Anglican Cathedral, St Johns Newfoundland. Lionel married Elizabeth. Elizabeth died after 1809 in Harbour Grace Newfoundland. + 20 F i. Rachel Chancey was born about 1782. She died on Feb 15 1860. She married Michael KNIGHT of Quidi Vidi, Newfoundland. Michael KNIGHT died Aug 12, 1854 in St Johns, Newfoundland. 10. Thomas Chancey (Lionel) was christened on Jul 7 1771 in St Andrews Cullompton Devon England. He died in 1808 in St Kitts, West Indies. Thomas married Elizabeth in 1798 in Newfoundland. Elizabeth died after 1807 in Carbonear Newfoundland. 21 M i. Thomas Chancey was born in Newfoundland. 22 F ii. Mary Chancey was born in Newfoundland. 23 F iii. Rachel Chancey was born in Newfoundland. ALL baptisms for the children of Lionel CHANCEY Sr and Elizabeth BEVIS are from transcriptions of the parish records of St Andrews, Cullompton where Lionel was the one to painstakingly write every entry. There are a few transcriptions not online so I was not able to find a marriage date for Lionel and his 2nd wife Sarah and as a result, her surname is unknown. Because Lionel and Elizabeth were married in the county of Wiltshire and had their 1st child in Dorset, it is probable that both of them were born in that part of the country before they moved to Cullompton sometime before 1750.